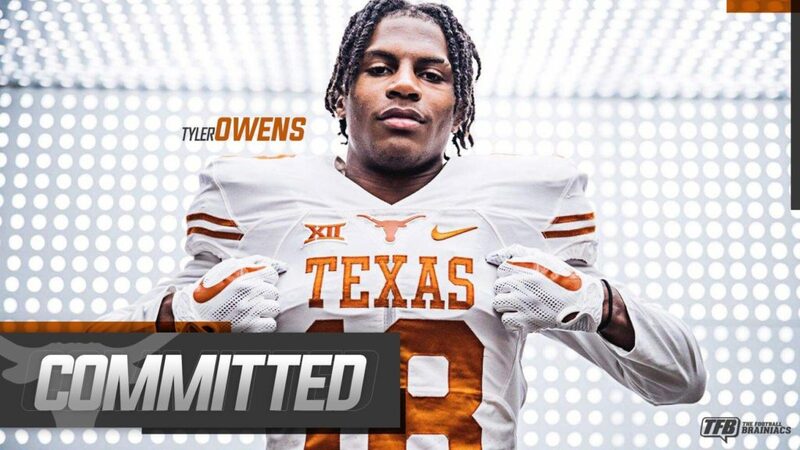 Texas has added another commitment following their big on-field and recruiting weekend vs USC in Plano East (TX) S Tyler Owens. This is a nice get for Texas and the main thing that comes to mind with Owens are the words freak athlete. But Owens is a legit 4.4-5 guy, he ran a 100m in the 10.3 range, he broad jumped 11’2 at Texas camp. And Owens is 6’2, maybe 6’3 and someone at the Texas camp told me he probably weighs around 210-215 right now. That’s really big for a HS DB, and after he get in a college weight program I could see him putting on 15 or so pounds easily. Owens could be the DeMarvion Overshown of the 2019 class. A bigger safety who may start his career in the defensive backfield but could end up sliding down to the rover/OLB position if he adds weight in a college S&C program. He had been trending Texas for awhile and the visit over the weekend just sealed the deal. Texas now has 17 commits in the 2019 class and 4 defensive back commitments from Owens, Alvin (TX) CB Marques Caldwell, Mayfair (CA) DB Chris Adimora, and Grayson (GA) CB Kenyatta Watson. I don’t expect this commitment to slow their pursuit of Jalen Catalon and Lewis Cine either.